Seismological networks provide data for better understanding of the dynamics in the Earth. A serious limitation on existing networks (e.g. IRIS (The Incorporated Research Institutions for Seismology) stations denoted by blue circles in the upper left figure) is the lack of stations in oceanic area. Earthquake Research Institute (ERI), University of Tokyo, has established a unique 2000-km-span seismological network in the western Pacific, including the state of the art deep-sea borehole observatories (orange circles) and island seismic stations (yellow circles). 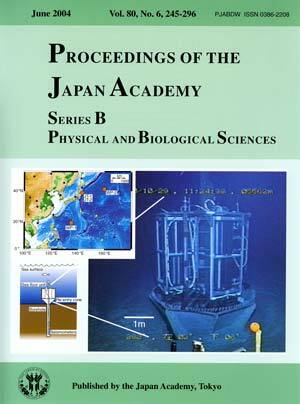 The former were installed in cooperation with the Japan Agency for Marine-Earth Science and Technology (JAMSTEC) in deep-sea boreholes drilled by the Ocean Drilling Program. No other functional deep-sea borehole stations currently exist in the world. Lower left: Schema of the WP-2 station. After completion of the drilling by the drill ship JOIDES Resolution, the seismometers were re-entered with the aid of a TV camera into the hole. Then cement was poured down the hole for fixing two broadband seismometers at 460 m below the sea floor. The battery frame was hung on a wire and was lowered along the drilling pipe. An acoustic signal was sent to release the battery frame, when the frame landed on the re-entry cone. Finally, the drill pipe was released just above the sea floor unit. After installation, the KAIKO, a remotely operated deep-sea vehicle of JAMSTEC, visited the station to activate the system. Right: Photograph of the sea floor unit of the WP-2 station at depth of 5,577 m, taken by the KAIKO (courtesy of JAMSEC). Below the sea floor unit, a re-entry cone, which was used for re-entry of drill pipes, can be seen. The sea floor unit contains a sea water battery for power supply and a data recorder package. The system can operate for more than 400 days. The KAIKO visited the station for recovery of the data recorder package and the world's longest seismic record from borehole station was retrieved. 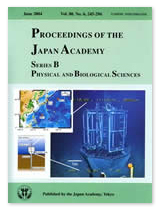 Written by Dr. Masanao Shinohara, Associate Professor, Earthquake Research Institute, University of Tokyo.